"Lionel Sainsbury's Five Fantasias for guitar are a substantial and valuable addition to the repertoire. The work exploits the full range of guitaristic sonorities and despite this being Sainsbury's first venture into guitar writing, the pieces are eminently playable but also highly original. The set is worthy of the attention of any concert guitarist and should stand alongside other great works of the 20th and 21st century in its scope and depth." 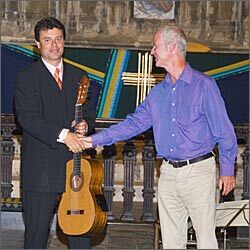 Craig Ogden and Lionel Sainsbury at the premiere of Intrada, the first of the composer's Five Fantasias for guitar, in the Lady Chapel of Gloucester Cathedral, Gloucester Three Choirs Festival, August 2007. "… a future two-piano classic"
This exuberant piece is the earliest example of the composer's enthusiasm for the rhythms of Spain. It is a veritable riot of sparkling writing for both pianos, with a subtle wit reminiscent of the world of Walton’s Façade. Fiesta dates from Sainsbury's student days. It was written at the request of Geraldine Peppin, a professor of piano at the Guildhall School of Music and Drama in London who enjoyed a distinguished piano duo career with her twin sister Mary. The work has been widely performed in the UK, particularly by Jeremy Filsell with the pianist and composer Francis Pott, and by twin sisters Claire & Antoinette Cann. Fiesta has also been played in Paris and South West France (Château de Jonzac) by François and the late Marie-Christine Doublier; in Japan (Chudon Hall, Nagoya) by Christopher Black and Yoko Katayama; and on BBC Radio 3 by David Johns and Jeremy Brown. Further performances are planned in France by French sisters Gisèle and Chantal Andranian. Fiesta is published by Novello. A piece written while the composer was a student at the Guildhall School of Music in London, and first performed by Philip Rowson, presently co-principal piccolo with the Orchestra of the Royal Opera House. "… posing a number of technical challenges to the flute player with its extraordinary athleticism. Even in the two slower, more lyrical sections there is considerable flamboyance, rather in the style of Honegger's Danse de la Chèvre". A work written when the composer was a student at the Guildhall School of Music and Drama in London, the Sonata was performed at Cambridge in February 2010 by violinist Rupert Luck and pianist Matthew Rickard, in a programme of British violin music which also included works by Britten, York Bowen, Elgar and Walton. The concert formed part of the Fitzwilliam Chamber Series, an annual series of concerts by leading musicians held in the Fitzwilliam College Auditorium. Lionel Sainsbury’s Violin Sonata was written in 1980 and, in the composer’s own words, is "one of the few of my early works which I still recognise!" The harmonic language of the Sonata is concerned throughout with the juxtaposition of semitones and their inversion, diminished octaves; and this formal unification is presented within an emotionally charged context which results in a highly compelling and memorable work. The Sonata’s passionate tone is clear from the very outset, as the opening upward surges in the piano herald the violin’s first charged entry. The importance of the major-minor tension is immediately apparent, too: it follows the opening trill, adding a vigorous impetus to the phrase that follows; a few bars later, however, a chromatic descent imparts a character of anguished longing, and this yearning quality prevails increasingly, building to a more wide-ranging theme of fervent intensity. After a short-lived, though burningly concentrated climax, the listener is swept into an atmosphere of other-worldly quality, in which the ethereal murmurings of the piano are overlaid with gently-winding lines in the violin. However, the music soon assumes a more brooding, almost menacing character; thereafter gathering in momentum and density with a further fortissimo climax of inexorable passion. A cadenza-like coda leads to a tense and subdued close. A short, impetuous Scherzo follows, in which lightning-like motifs spark between the two instruments. The third movement, Allegro con fuoco, is characterised by a fiery energy, only twice giving way to brief lyrical passages. The semitonal clashes however, remain ubiquitous, the strength of their linear dissonance driving the music relentlessly forward. The work’s coda is a veritable powerhouse: quavers, hammered out in the piano, are set against ionised semiquavers in the violin, which crackle with vigour; and the Sonata ends with an explosive unison assertion. The sonata has also been performed in London and at Windsor by violinist Oliver Lewis and pianist Jeremy Filsell. An early work written while the composer was living and working in Paris. The expansive Blues is the centre-piece; ranging freely in mood from languid to bold and extrovert, it is framed by a brief lyrical Prelude and a scuttling scherzando Postlude. The piece was premiered by Peter Cornish, a former member of Birmingham University New Music Group, and the composer and pianist Francis Pott at the London College of Music in Ealing, West London on 24 March 2009. In his programme notes for the concert Francis Pott observes that "certain of Sainsbury's works reveal a sensitive personal response to American music of the late twentieth century, with occasional oblique echoes of Carter, Copland and Barber, some of which can be detected in the Prelude, Blues and Postlude". "The Prelude, a seamlessly lilting introduction, balances a warmly lyrical harmonic palette with something of the sparse textural austerity we find in some of Copland's musical landscapes; it serves also as a counterpoise in general weight and duration to the droll Postlude, where sly understatement is apparent in both the brevity of the music and its throwaway ending. Between comes a lengthier, streetwise, heavily accentuated slow Blues movement, transporting us rapidly from the open plains to nocturnal urban surroundings. Though the composer's sense of humour is never far beneath the surface, an undercurrent of evocative melancholy persists until the Postlude blows it finally away. A model of its kind, such a piece is more haunting than possibly its composer consciously intended, and serves to remind one of Auden's contention that a demotic kind of language is essential to the communication of true poetry." In 1991 Lionel composed his Two Cuban Dances for piano, making this arrangement of No.2 for violin and piano the following year. It was immediately taken up by the violinist Tasmin Little, who gave the world premiere with pianist Piers Lane at Music at Leamington Hastings in 1992. Little subsequently gave the piece as an encore at the Wigmore Hall, and has since performed it all over the world. In 2004 she programmed it on a tour of Japan with Akira Eguchi, including a performance at Toppan Hall, Tokyo, recorded and filmed by NHK Radio/TV. In 2003 she and John Lenehan recorded the Cuban Dance as part of Tchaikovskiana, a CD of popular virtuoso pieces for EMI Classics for Pleasure. By popular request this recording of the piece was featured on Radio 3's '3 For All' in April 2006. The Scottish violinist Lorraine McAslan, who has championed Sainsbury's Violin Concerto, has also featured the Cuban Dance as an encore at the Wigmore Hall with pianist Nigel Clayton. ‘… it is an eloquent and dramatic work, exploiting the sonorous qualities of the violin to the full’. An atmospheric, even impressionistic piece, with a hypnotic, almost trance-like feel. There is an equal partnership between the instruments throughout; the violin's haunting themes interweaving with richly glinting harmonies and textures in the piano. An arrangement of the Two Cuban Dances (originally composed for piano solo) made at the suggestion of the French pianist François Doublier. It was premiered in France by Christopher Black and Yoko Katayama in the spectacular setting of the Eglise de Beynac, as part of the 1998 Nuits Musicales de Beynac-en-Périgord. In 2006 Black and Katayama included the pieces in their 20th Anniversary Tour, performing them in Tokyo (Piano Art Salon), Osaka (Ishihara Hall, Izumi Hall) and Fukuoka (Yukuhashi Cultural Hall). The arrangement has been widely performed by Claire and Antoinette Cann in the UK, and programmed alongside Gershwin, Gottschalk, Oscar Peterson and Erroll Garner by Gisèle and Chantal Andranian at Vissi d'Arte, Paris, in 2008.